Thus far this year I’ve had 7 auditions! Something must be changing… I got 3 of them, so not a bad hit rate really! I played Sam a loser drug dealer, in the Channel 4 Drama "Kiri” written by good old Jack Thorne, and I recently filmed my scenes for another C4 drama, this time a post WW2 civil service role, written by the wonderful Bash Doran. I can now sing a bit of G&S, who’d have thought it. And right now I can’t say exactly WHAT, but I just got a BBC job, a smallish part in a fantasy adventure drama, spanning 8 episodes, which will film July through to November, in Wales…..
DirecTV in the USA commissioned a 2nd season of Peter Farrelly & Bobby Mortimer’s “Loudermilk”, the comedy about a maverick alcoholic (played by Ron Livingstone) and his disfunctional 12 steps group, in which I play the English drummer, Roger. We’ll be filming some time from July. In the 1st season, drumming in the fictional 90’s hair metal band Sauced Puppy’s thankfully equally fictional hit “Boilerbreaker”, was an unexpected highlight of that filming in Vancouver, and it was a great episode by Dave Connaughton et al, in a funny, happy time. Working for Peter Farrelly as a director is the best, he’s fantastic on set, as is Bobby and the whole team. Getting a 2nd season commissioned is really exciting, who knows what Roger will do…There’s a trailer for series 1 in my videos section. Finally for this Spring update, I already described how last June 2017, I wrote the ONEOFUS version of “Jack & The Beanstalk”, Julie Atlas Muz my partner in our Company/Art Cell ONEOFUS, and my lovely wife, directed, and it turned out to be a big hit critically when we put it on at our local and favourite off-Broadway Theatre, Abrons Arts Center in New York’s Lower East Side.I re-wrote a lot of the old fashioned aspects - upgraded the lead romantic woman to be a warrior too, shared the rescuing amongst characters, and made the thwarting of the Giant (one Giant Rump of Rump Towers) something that the whole community had to be part of, to promote collective community strength in the face of austerity and adversity. We had as diverse a cast as you could want, and it was certainly tinged with rainbows. Then after many discussions with Julie director, we agreed the nostalgia aspect should be NYC of the 1970’s, not Olde Engande etc, and then finding the best cast, we, amazingly, succeeded in engaging our local community in it, to the HILT! 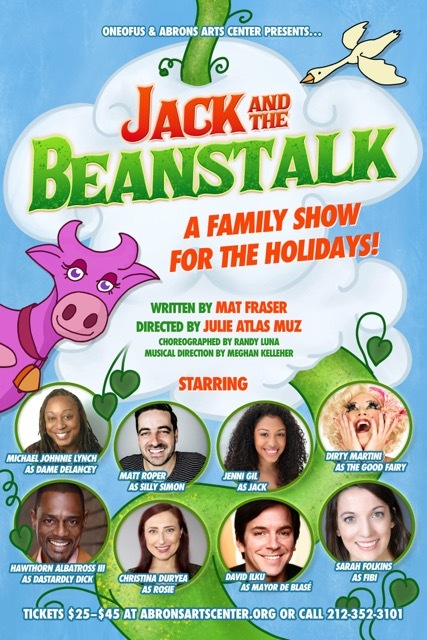 We have just announced that we will stage a tighter written re-mount for this December; proper publicity and marketing advertising coming later, but for now, in case you wanna book, Jack & the Beanstalk is scheduled to be presented in Abrons Playhouse Theater from Dec 14-16; Dec 20-23; Dec 27-30, 2018. Afternoon and evening shows.